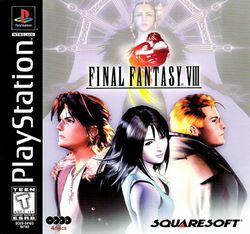 Final Fantasy VIII (ファイナルファンター VIII, Fainaru Fantajī Eito) is a computer role-playing game created by Square for the Sony PlayStation and later for Windows. It is the eighth installment of the highly-acclaimed Final Fantasy series, the second to be released for the PlayStation and the second to the adapted for Windows (the first being Final Fantasy VII). Final Fantasy VIII has sold 7.86 million units worldwide, becoming the third best-selling title of the series behind Final Fantasy X and Final Fantasy VII. This page was last edited on 30 May 2016, at 05:18. This page has been accessed 42,275 times.